FREE Outdoor Concert. 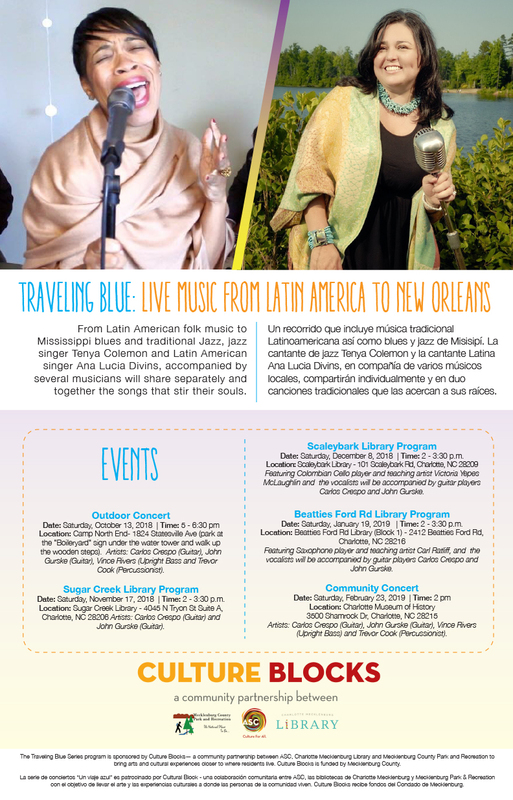 First of five programs included in the series ‘Traveling Blue’ Music Series – Latin American folk music to Mississippi blues and traditional Jazz with jazz singer Tenya Colemon and Latin American singer Ana Lucia Divins. These local Charlotte vocalists will share separately and together the songs that stir their souls. For this interactive concert the vocalists will be accompanied by: Carlos Crespo (Guitar), John Gurske (Guitar), and Trevor Cook (Percussionist). The Traveling Blue Music Series program is sponsored by Culture Blocks— a community partnership between ASC, Charlotte Mecklenburg Library and Mecklenburg County Park and Recreation to bring arts and cultural experiences closer to where residents live. Culture Blocks is funded by Mecklenburg County.